Our goal today was to drive 118 miles from Capitol Reef to Bryce Canyon, via Utah’s semi-famous Route 12. 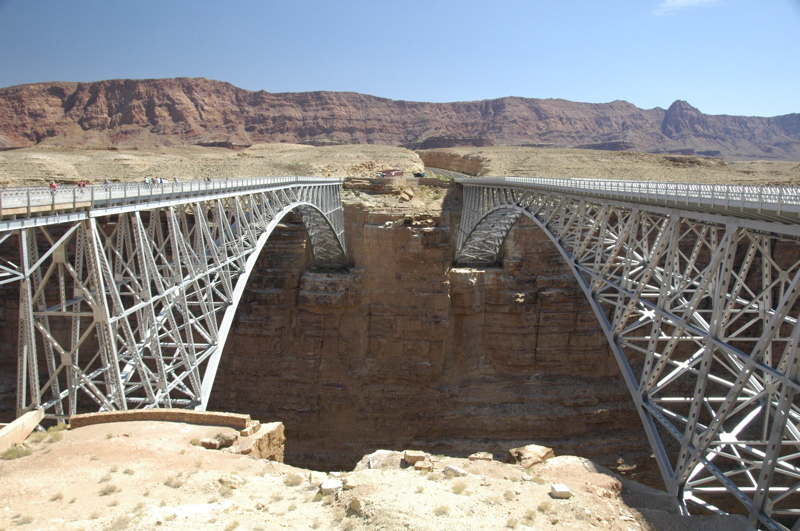 This route goes through parts of the Dixie National Forest and the northern edge of Grand Staircase-Escalante National Monument (BLM). We’d been told it was an eye-popping drive, but unfortunately the weather was uncooperative and a lot of the views from 9000 feet and above were obscured by passing rainshowers and fog. Coming down past Boulder, the view improved. 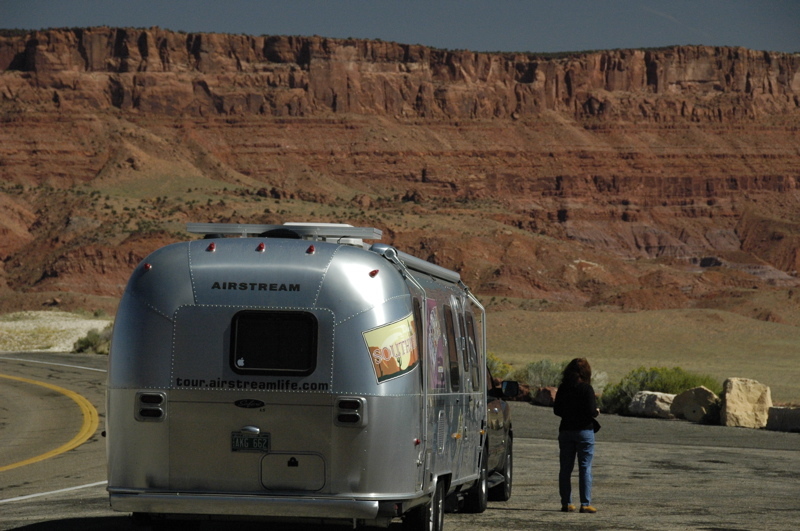 We had considered stopping at the Calf Creek BLM campground, but passed it by with a note to perhaps visit it on another trip. 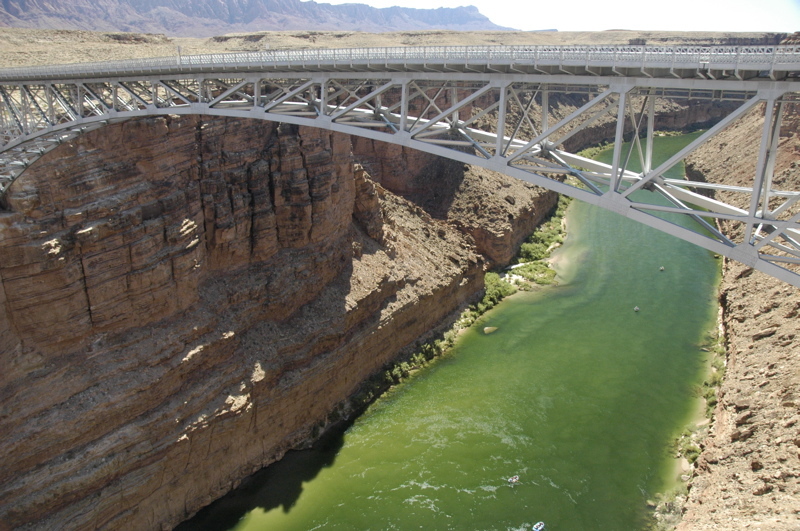 It’s located down in an absolutely beautiful canyon, not far from the spot we were overlooking in the photo at left. I must be getting used to driving out here on the Colorado Plateau. We rolled up and down grades ranging from 8% to (briefly) 14%, climbed above 9000 feet on curvy roads with no guardrails, in and out of rainshowers, and my reaction to most of it was “ho hum…” Not that it wasn’t beautiful, but the adrenaline rush that usually accompanies towing under such conditions was distinctly muted. Mostly I toodled along, one hand on the wheel, one hand on the transmission stick, thinking about when we should stop for lunch. 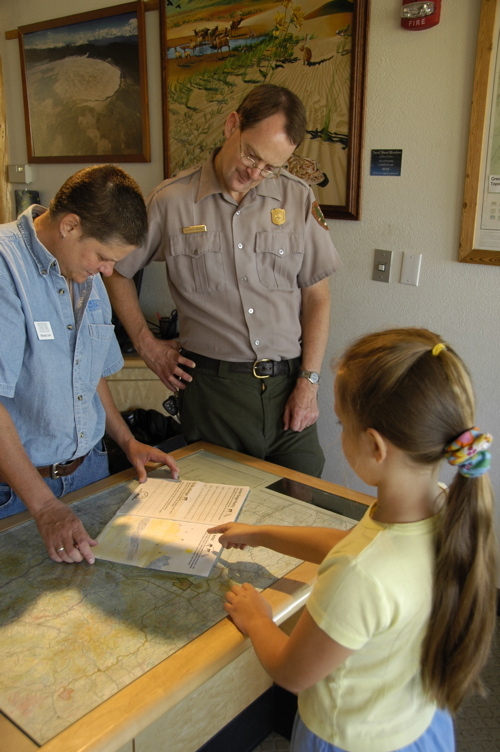 Which eventually we did, at the visitor center in Escalante. While we were parked there, we ran into Rick, another Airstream full-timer traveler who has been out on the road for about three months so far. 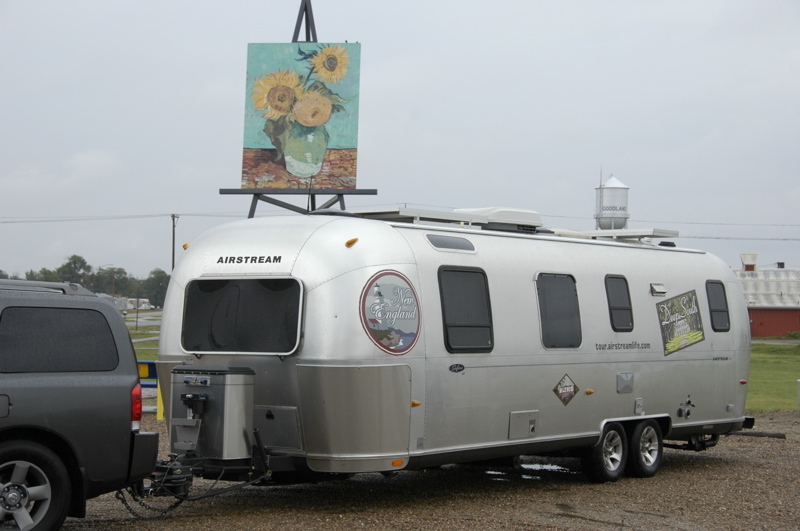 He’s got a sweet 1976 Airstream 30 footer that he refurbished and customized. We hung out for a couple of hours, swapping travel notes, and may meet up again later this winter. Rick’s blog is a bit out of date but he’s planning to get caught up on his latest travels. With all the puttering, we didn’t get to Bryce until about 5 p.m. 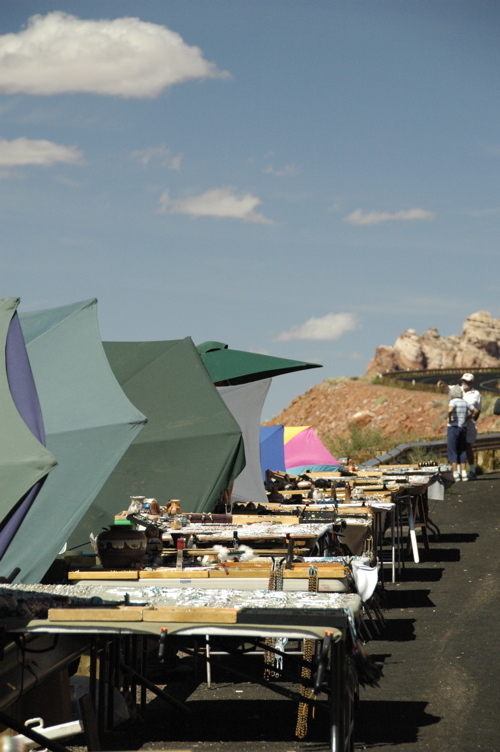 The national park’s campgrounds were mostly full, and the few remaining spaces were either too short or very unlevel. The entire North campground seems to have been built on a hill. Also, the site were entirely shaded, which would give us no useful solar power. We decided to go upscale and pay for Ruby’s campground just outside the park entrance. This is a big luxury for us. We’ve been camping without hookups of any type for a week, which has allowed us to stay close to the parks we’ve been visiting. Upgrading to a commercial campground is like splurging on a five-star hotel. We’re getting full hookups, wifi, a laundry, two swimming pools, two restaurants, and my phone works too. We’ll catch up on laundry, work, email, phone messages — all those annoyances of “real life” –and work in a few hikes in Bryce too. Early Sunday morning the rain began in Silverton, a tap-tap of fat drops that steadied into a drizzle by the time we got out of bed. This rain had been forecast, but the Silverton forecasts are often wrong (I was told), so I had hoped it would not come. 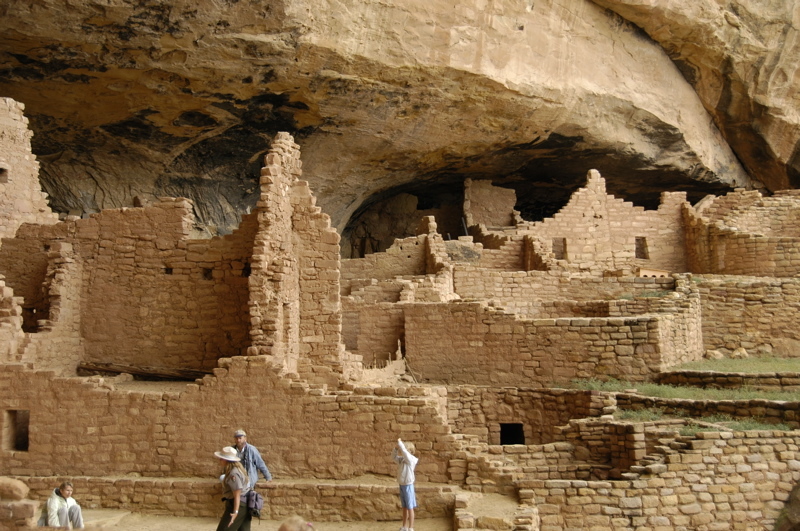 Our task for the day was to drive back along the Million Dollar Highway to Durango and then to Mesa Verde National Park. This is the same highway we arrived by, which meant again we needed to cross two very high passes with steep ascents and descents: Molas and Coal Bank. Now the task was complicated by wet roads and occasionally dense fog. So we prepped everything, donned our rain gear, and said goodbye to Mike and Tracy. We expect to see them again over the winter in Tucson and perhaps Quartzsite, and even Silverton next summer. Like bats before flight, we first stopped at a nearby campground to offload about 200 pounds of black and gray water. (Campgrounds will usually allow you use of their dump stations even if you aren’t staying there, for a fee, in this case $5.) Two hundred pounds may not seem like much in the context of a combined rig that weighs closer to 14,000 pounds, but amazingly it does help a bit with the power when climbing 7-8% grades for many miles. Since driving conditions had the potential to be nerve-wracking as we wound up and down the steep grades with few guardrails, everyone kept silent. This is a technique used by airline pilots (the “sterile cockpit” rule, which says that there can be no unnecessary chatter on the flight deck of an airliner below 10,000 feet), and it really helps. I got the rig into a nice steady groove in second gear as we climbed out of Silverton, and we rolled along steadily until the road finally straightened out 20 miles later. Steady is the key. A road like this is constantly inciting you to speed up on descents and slow down on ascents & curves, and if you give in to it you will find yourself either standing on the accelerator or brake nearly all the time. This is hard on the rig and can easily lead to loss of control. Remember, you’ve got thousands of pounds of cargo behind you, just aching to push you sideways on a descending turn. On a climb the engine or transmission can easily be overheated. And brakes will fade to worthlessness once they get too hot. So we used every advantage we had. The Hensley hitch kept the trailer straight, we stayed in second gear the entire time for engine braking, and I tapped the disc brakes lightly on the descents when engine braking wasn’t enough. I kept the speed within a band from 15 MPH (on the hairpins) to 35 MPH, and watched the RPM gauge to keep the transmission in its ideal range for cooling. Cars and motorcycles stacked up behind us, and would occasionally pass in suicide maneuvers. The entire road is a no-passing zone, for good reason. The speed limit is generally 30-35 MPH and much slower in curves. There are few pull-outs, so most of the time there’s nothing you can do about impatient people who want to shave two minutes off their trip. If you find yourself in this situation, don’t let pressure from vehicles behind cause you to drive beyond your rig’s abilities. If you are wrecked on the side of the road after going too fast on a wet foggy mountain pass, will they stop and take responsibility for it? Will they go to the hospital on your behalf, or buy you a new truck? Unless you are sure the answer to all these questions is “Yes,” let “˜em wait, or use the next available pull-out. The only really intimidating part of the ride was one point when we were descending to a steep hairpin turn in dense fog. I could not see the turn even two hundred feet from us, but fortunately the GPS map showed me it was coming, and being in fog I already had the Nissan and Airstream slowed down to 20 MPH. Steady as she goes. I’ve mentioned before not to trust the GPS when going to state or national parks, but I’ll say it again. Coming to Mesa Verde from the east, Garminita wanted us to exit the highway onto a dirt road named “H-5.” Knowing that she tends to get excited when we approach a national park, I disregarded this and continued another mile down the road to the proper (and well-marked) exit. Good thing, since H.5 doesn’t go anywhere. I pity the RV’er who follows that direction from their GPS. Attempting a U-turn on a narrow dirt road (or worse, backing up a half-mile) is not fun. 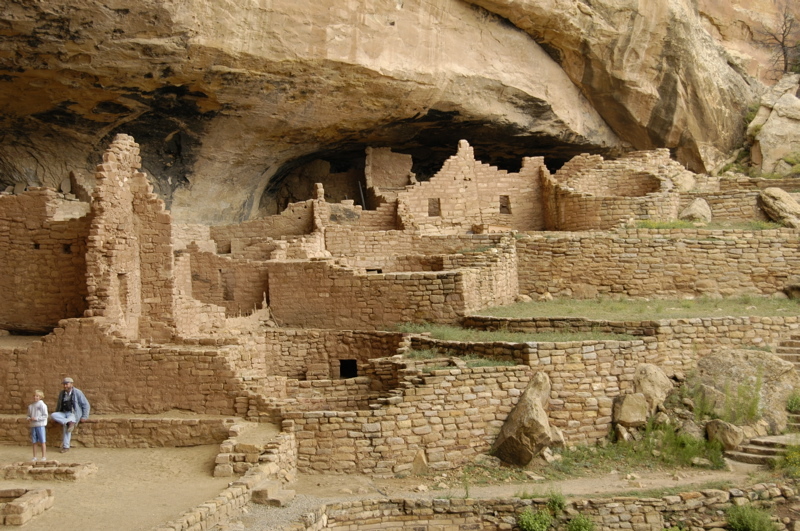 Mesa Verde is a large park containing over 600 cliff dwellings, 4,200 other ancient dwelling sites, and many miles of twisting roads. 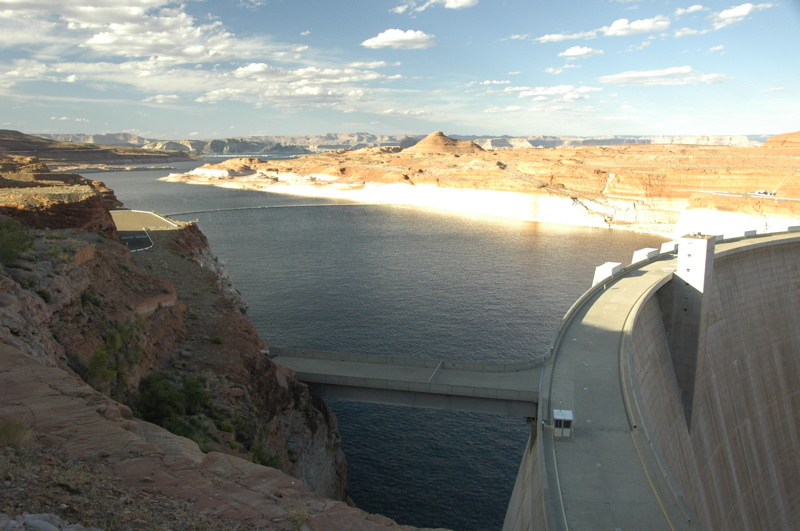 Those roads connect to just a handful of sites that are open to the public, and trailers or motorhomes with vehicles in tow can’t traverse them. Motorhomes over 25 feet long or 8000# GVWR are prohibited entirely from the road to Wetherill Mesa. Even after driving five miles into the park to set the trailer in Morefield campground, it was another 11 miles to the Visitor Center, and an additional 12 miles to Wetherill Mesa, where we took our first tour of a cliff dwelling. I had chosen to stay in the park at Morefield because (1) we always like the national park campgrounds for their convenient access, low prices, and generally attractive settings; (2) the NPS website said, “It never fills,” so even on Labor Day weekend we didn’t need to worry about reservations. Alas, Morefield was a slight disappointment. Now I know why it never fills. The price when we arrived was not $14 as published on the website, but a startling $24.05 per night. That’s a lot for an unlevel, weedy, primitive site (meaning no hookups). Bathrooms are nearby, but showers are inconveniently located over a mile away. Still, the location is at least five miles closer than the nearest commercial campground. 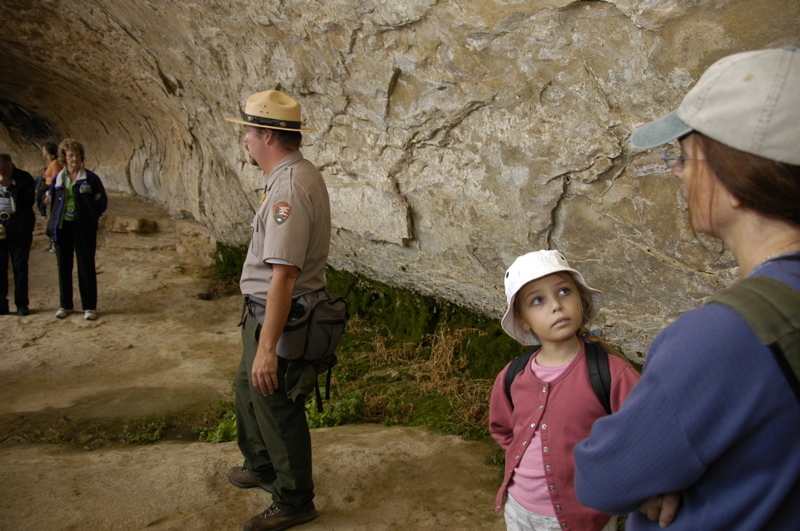 Since we arrived in Mesa Verde in the early afternoon, there was time to explore one end of the park. At the Farpoint Visitor Center, the road forks into two. 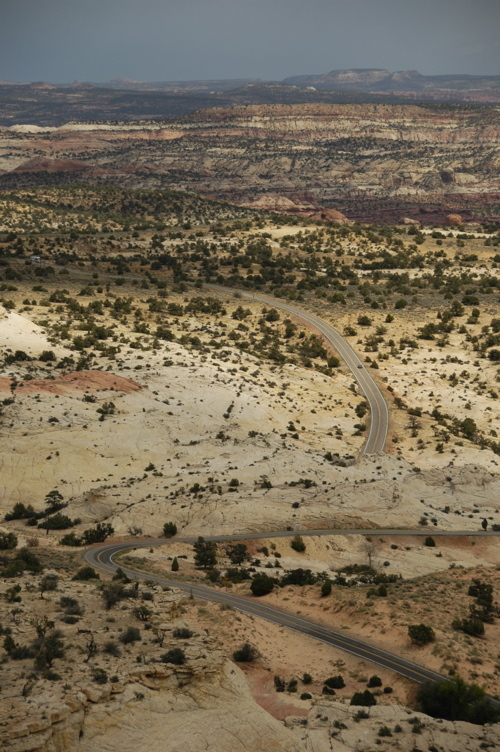 One road leads 12 miles to Wetherill Mesa, and the other road leads 5 miles to Chapin Mesa. Although the distances don’t seem long, the twistiness of the roads means that the 12 mile drive to Wetherill takes about 30 minutes. Since there are multiple sites to visit at both mesas, and the drive times are long, it’s impossible to see everything in one day. 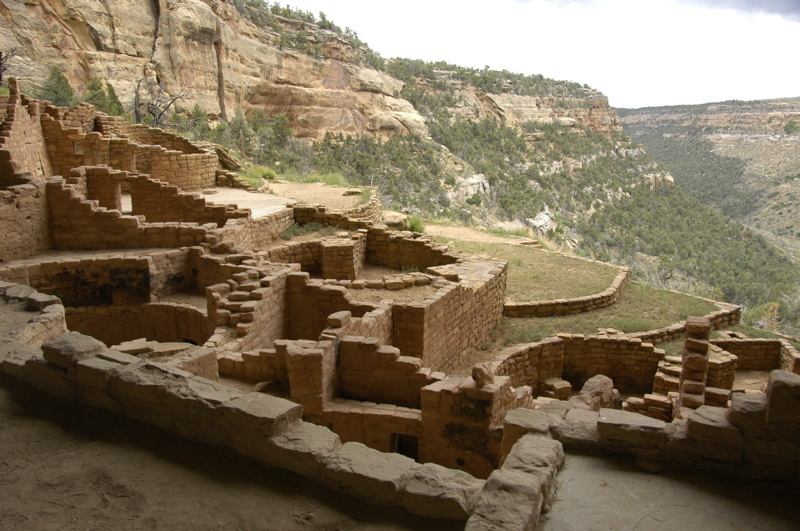 We caught the last (4 pm) tour of the day at Long House, the second-largest cliff dwelling in the park. It’s also the longest tour, at 90 minutes. This visit made up for the tedious drives of the day, because Long House is just spectacular. With overcast skies in the afternoon, the light was perfect. Inside the dwelling I used bounce flash to fill in a few shots, but for the most part it was just natural light. I shot over a hundred images and wished I’d had time for many more. I’ll be setting up a new album on Flickr for some of my favorites. Getting to Long House requires a tram ride, a steep set of stairs, and a hike of about half a mile. Exactly at the end of the tour, the skies opened up and a deluge started “¦ and of course, being optimistic, we left the rain jackets back in the car. We weren’t the only ones. Half a mile later, about a dozen of us arrived at the tram stop utterly drenched, and then sat down on the flooded plastic benches of the tram for a soggy open-sided ride back to the parking lot. The rain meant there was no chance of us attending the Ranger talk in the amphitheater at Morefield campground, so we dragged our dripping selves back to the Airstream and fired up the catalytic heater to maximum. If there’s any fun in getting soaked in the rain, it’s the moment you take off all the wet clothes and put on dry ones, while standing in front of a toasty heater. We hung our wet stuff in front of the heater, including our shoes and Emma’s stuffed cat Zoe (she goes along for every hike and really doesn’t like getting wet), and watched a movie while eating pecan-crusted boneless trout filets that we bought at the Great Machipongo Clam Shack in Virginia last May. That made a fine end to a long and wild day, and it felt well worth the trouble of towing the Airstream over the mountains to have it waiting for us with warmth and dinner and comfort. We’ve been pondering the choices ahead, and have made some decisions. Mostly, we’ve decided that the opportunity to go explore a bunch of the country’s best national parks in late August and September is too much to miss. The Four Corners region is one of the most densely packed areas of national parks, and some of the most famous and beautiful ones are here. We don’t know when we’ll get this chance again. The added mileage will cost about $300 in fuel. We’ll also spend about $400 in additional campground fees. For that we’ll get four or five weeks of travel through 11 national parks. That’s a heck of deal for $700. Since we are spreading the cost out over a month, we can afford it more easily. It’s about $20 per day. The real consideration is keeping up with work. 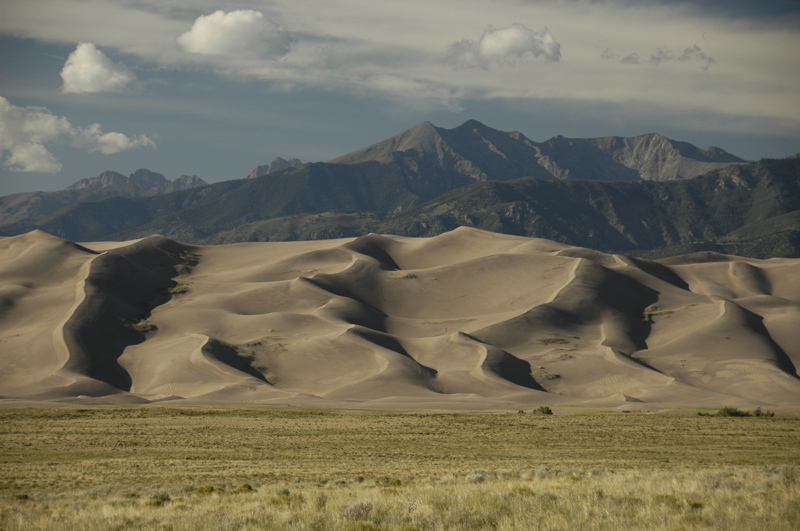 The western national parks are generally out of range of cellular Internet and voice. A few campgrounds have wi-fi (which we know from past experience is unreliable), and a few spots can be reached from towns with cell phone service like Cortez CO. We’re going to have to juggle work and play carefully. The idea is one we’ve used all along. When things are quiet, we scoot into a national park and drop off the network for a few days. Then, we drive to the nearest place where I can get online and Eleanor can catch up on groceries, laundry, etc., and settle in for a few days of work and homeschooling. Three or four days later, we move on to the next remote park and repeat. The challenge in the four corners region especially is that there’s a lot more “remote” territory than anything else. It’s also much more expensive to park in a wi-fi enabled campground than in the national park campgrounds we favor, usually by a factor of two. Since we are trying to compensate for higher fuel prices, we’ve been tending to free and cheap campsites more than usual. The work periods will drive up our expenses. That’s a good motivator for me to get the jobs done as quickly as possible. Efficiency pays when you’re working and full-timing. With all these competing factors, we can’t say we have a firm plan, only a route and a set of guidelines. So we can’t make reservations. We’ll just have to wing it, as usual. Sounds like fun to me. I suppose if I must have a cold while trying to cross a broad swath of the USA, Kansas is a good place to have it. That’s because I can never equalize my ears when I have a cold. Nothing works for this problem, including medications and various techniques used by divers. So typically a cold means I am restricted to one elevation until it clears up, and absolutely no flying. Fortunately, the drive east to west across Kansas is a gentle rise most of the way. We pulled out this morning from our quiet and scenic spot by the lake near Baldwin City at about 1,600 feet elevation, and eventually ended up here in Goodland at 3,700 feet. That climb — if you can call it a climb — was spread over about 300 miles, or about 3.6 feet elevation gain per mile. Nice and gradual, and easy on the three people in the car who have colds at the moment. Yes, now there are three. Emma started having symptoms last night. Only Eleanor has so far escaped the viral wrath from Florida. After two long days in the car I thought Emma would appreciate a short day today, with lots of breaks to run around, but when she got the cold we changed the plan. There’s nothing like a virus to take the edge off a kid. She was happy to spend most of the time sitting in the car playing with her toys, and I was happy to have Brett as chauffeur for most of the day. Goodland is a nice place to stop along I-70. We’ve been here before. The town is big enough to have good services, and small enough that there’s not much traffic. Since we have only 200 miles or so before Denver, we’re going to spend sometime here on Sunday to explore the various sights in town. Maintenance report: I think there is something wrong with the auto-leveling system on the Armada. It has a factory-installed airbag suspension in the rear, but it appears to have a slow leak. We’ll check that in Denver at a Nissan dealer. Solar report: We’ve been running on battery since we left Jackson Center, with all three fans running all night and lots of light and water pump usage. We haven’t been frugal with our power at all because there has been abundant sunshine to recharge the batteries. This afternoon the batteries were at 81%, not bad. It’s summertime and the livin’ is easy … on solar power.